Find a mentor to help you learn the ropes of distance riding for both horse and rider. Don't be afraid to ask! Continue talking with your mentor as you condition your horse(s) and start learning what works best for you. Eventually we'd love to see your name here! Get experience to give back what others have shared with you. If you are a zero-miles-I-have-never-done-a-distance-ride-or-close-to-it rider, fill out the Mentorship Request Form and our ever-ready Mentor Chair, Jennifer Kaplan, will be reaching out to you to ensure your success with a good mentor. Beyond that, it’s up to you and your mentor. See below for more info direct from the horse’s mouth (Jennifer, our Mentor’s Mentor)! * Program note: this is voluntary. If you really think you don’t need a mentor, you can just choose not to take advantage of the mentoring program. * If you just want a mentor because you feel you could up your game, even if you have, oh, I dunno, a gazillion miles but are still learning–cool. We’re ok with that. Just let Jenn know by emailing her at her address (rushcreekford@gmail.com) and she will set you up. Hello to all of you!! If you’re reading this now I can only say that you have made a great decision to take advantage of EDRA’s mentorship program. We believe there are no “stupid questions.” I have lot of questions and I always try to ask as many questions as I can. This is your venue. You can ask all your questions and get advice. My name is Jennifer and I will be trying to coordinate all of you mentees with a mentor that we feel will be a good fit. If for some reason it’s not a good fit please don’t hesitate to let me know and I will do whatever I can to facilitate. So here’s how it going to work (at least for now, because who knows we may figure out a better way to communicate). All of you interested in having a mentor please answer the following questions and then send them to me in email form. I will then send them on to which ever mentor seems like it would be a good fit. Than you and the mentor I have put you in contact with will communicate between yourselves in whatever manner you guys choose. If for some reason it feels like a bad fit please let me know and I will try to set you up with another mentor. Here are a few questions I would like you to answer so I can pair you well. I look forward to hearing from all of you! It’s time to throw a leg over this program and see where the ride takes you. Let’s get out there and “Start Ready and Finish Proud”! In a nutshell, what is your experience with horses? Have you ever done a long distance race with your horse? Do you have a goal for this upcoming season, or seasons? What breed horse do you ride/compete on? On a scale of 1-10, How competitive a rider do you see yourself? 1 being really excited to finish your first distance ride thru 10 wanting to win a 100 mile ride? What kind of information do you desire from your mentor? How do you prefer to interact with your mentor? I am many things but two of the things that make me who I am are my kids and my horses. I started endurance when my daughter was 3 and my son was just born. I lived in rural eastern Montana , had lots of country, a good little horse and no one to ride with. I just kinda winged it and learned on the fly. I didn’t know the first thing about electrolytes, feed or specialized training. I had some good friends that were trainers and we rode a lot and it all worked out. My trainer friends weren’t endurance riders but they knew A LOT about horses. I learned a ton from them, conformation, feet, how to get a colt to lead, how to train a colt to tie solid, what is acceptable behavior and what is not. One of the most important things I learned from them is that a horse is capable of lot more than you would think. My jaw hit the ground the first time I saw my friend riding her stallion in the arena, pick up a barrel racing barrel from the back of her horse and carry it the other end of the arena while riding. Or the first time I saw a rather aged cowboy open and shut a wire gate from the back of his colt. Or rope a calf that got stuck in the alkali. I learned that our horse is capable of lot, as are you. That’s how I approach my endurance riding: have fun, learn new things, set the bar high and then work for it. Ask a lot of questions. The more I learn the more I realize how little I actually know. I am just shy of 5000 race miles and have ridden in the front, in the back, in the middle, at all distances and placing from first place to tail end. I have really talented horses, and I have horses that would rather stay home. Figuring out what you and your equine can do is all part of the journey to becoming the best you can be. Finally: I can honestly say that there is nothing I enjoy more than riding a race with my kids. I know a lot of games, songs, stories , what kind of snacks pack well in saddlebags, what to do when the tears come, how to teach kids how to be good sports, and how to be responsible for their horse. If you are trying to do this sport with your kids I am here to tell you it can be done and it can be done with a lot of love and laughs. 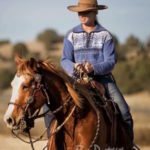 I have been involved in long distance riding since 1998 on my show Arabian, Janey – she had been shown as a youngster in halter then we did mountain riding, fox hunting and even did some team penning and herding cattle. I had the misconception that to do distance riding you needed a crew and it was a point to point but fortunately met someone that informed me that was incorrect. Klickitat Trek was our first ride and have not looked back. I now am riding Janey’s son, Dash and in 2017 it will be our tenth season as a team. He will be my second ten year horse. You are most welcome to come and train with me in the ‘canyon’ (Oregon City area)…mostly rock roads and good hills…it all depends on time availability and agenda of the day as to how many miles and hills we will complete. Rain or Shine…because I work during the week and in the early part of the year (February) I will be out both days. As the daylight hours lengthen then also get out twice a week after work for a few hills. Their nutrition will be changed to accommodate the increase demand of energy as we condition for the season. I firmly believe in the steady pace and it has worked well for us over the years. Start Ready and Finish Proud! I started endurance and ride and tie in 1982 while at WSU in grad school. I was looking for a sport that could combine my love for running and riding horses in a fair but competitive environment. Distance riding was the perfect fit! I attended a clinic sponsored by the IEDR (Inland Empire Endurance Riders) and met Lorie Stobie who became my mentor and best friend. Lorie had several thousand miles experience and was wise about the welfare of the horse before that ever became a focus for rules. I still use everything she taught me (and a host of other mentors along the way) during our years of riding and traveling together. I have just shy of 7000 miles experience. I have ridden every distance 25-100 and 2 and 3 day rides. I have been tail end and have won rides and earned BCs and everything in between. I have had talented competitive horses and horses that I rehomed to a new career because distance riding wasn’t their forte. I’ve ridden a number of horses and all that I’m no longer riding retired healthy and sound to second careers after endurance riding. I am currently starting a new horse with the aim of having a competitive 100 mile horse. I have 34 years of experience with distance riding and 32 years of experience as a high school science teacher so I bring communication and organizational skills to the table. I really like helping new riders get started in distance riding because my mentors laid the foundation of my career early and helped me to avoid some of the common pitfalls that happen to beginners. I have mentored several riders that have gone on to become active distance riders. I am a competitive rider – but know how to balance my need for competition and my horse’s welfare. Distance riding is my passion and my Zen time and my nirvana – I love helping other people to discover the joy of bonding with a horse and being a team member with a spectacular equine. I became interested in endurance in 2003 at the age of 50. I was given the book “The Great American Horse Race” about the pony express ride/race across the country in 1976. I found it to be very inspiring. At that time I owned a big quarter horse and a paint John mule. Neither were suited for the sport. I had only ridden a bit and mostly back country packing type stuff. Did not have any childhood experience with equines. The mule and I learned the sport together and he mostly forgave me for my mistakes. I gleaned information from everywhere I could. I did a season of LD’s but I knew I wanted to do longer distances. People were friendly and helped me. I hung out with people who had lots of miles and I found they would answer questions. I wandered camps and looked at gear, pens, rigs, tack and horse foods. I went to conventions. Then I moved up to 50’s and longer. I was a mid to back pack rider. My old mule Junior did nearly 4000 miles and ten 100’s including Tevis, Bighorn and Swanton Pacific. Never got a win or a BC yet I consider him a champion today. He was bred to chase a cow 200 feet and rest. Non-typical breeds and types within breeds can do the sport but bring challenges. I rode the pony express 2011 race from St Joe Missouri to Virginia City Nevada. Fifty miles a day five days a week. I started with two mules and an Arab. One mule made it all the way. She did 19 rides 50 miles plus in 2011. The other two lamed up and I switched them out. It was an eye opening experience to watch equine management on that trip! Today I ride my first Arab who I got as a baby. I also ride a mule that is very suited for endurance. We go faster yes and it is a terrible amount of fun. However if I had the equines I have now when I was new to the sport some or all of us would not have survived. I would have had no idea how to manage a big forward Arab or a rank mule with a lot of attitude and go. I was lucky to have good mentors and I hope to be able to help folks wanting to learn the sport. But be careful… it can change your life!! My endurance career started back in 1988 and I can blame it on a Western Horseman magazine. While on a pack trip in the high country (our hobby at the time) I brought along a magazine that had an article on the Tevis and on adopting BLM Mustangs. At the time I had never heard of the sport of endurance riding and I had no idea about the Mustang situation in the US. Being young, curious and very headstrong I made it my mission to adopt a BLM horse with the goal of doing this Tevis thing. As luck would have it our hunting partner at the time happened to board his horse with someone that did this crazy endurance stuff. We got hooked up (thanks Laurel Kingman) and almost 20,000 miles and 50 plus 100 mile rides including competing all over the world the rest is history. I started out on 50’s with an 18 year old Quarter horse eventually doing longer distances with her. I did adopt a BLM horse; B Banshee who became one of 3 of my Decade team horses and I did complete Tevis on her. I excelled at riding non-typical bigger bodied horses in the longer distances and although they aren’t all suited for this sport I feel I can help riders that have that one that is an exception to the rule. In 1999 I decided to go to Farrier school in Walla Walla WA as I had always been intrigued with horses’ feet and was excited to learn the craft in hopes it would give us an edge in the sport. I have since been educated on the use of synthetic shoes and glue-ons and although use all types of shoes I believe having a large bag of tricks is what makes us successful. I was at a feed store one day in 1987 happened to notice an advertisement for an endurance ride in my area. I didn’t know much about endurance, but I was intrigued as I rode my horse all the time. I figured this was the sport for me! I hated the show ring and the western type riding was too boring. I tore off the contact number and never looked back. Little did I know my life was to change forever. I have enjoyed endurance riding for 29 years. Some years I didn’t compete because of moving and other life events, but I never stopped training my horses. I have almost 10,000 competition miles. My entire life is centered around my horses. They make me who I am, and they make me whole. I have mentored several riders over the years. I’ve helped them with conditioning, feeding programs and actually hauling them to rides. I usually have a young horse to ride, so bringing along a newbie is the perfect combination. I enjoy sharing what I have learned over the years. It takes dedication to bring along a strong competitive horse. I have found few riders are willing to put in the time or the miles to be competitive. That’s OK, as long as we are having fun and our horses are enjoying it too. I started endurance riding in 2002. I have a less-than-competitive ride history—I just like to go, see new places and see friends, hang out with horses, and ride through the beautiful Northwest, in the presence of veterinary help if I need it. Endurance lets me do that. I don’t have a lot of time to train, so usually just stay with the limited distance rides. I’ve done about 10 50s. Nothing longer. If I can ever retire, that might change. I over prepare everything if humanly possible. I try to think of every possible contingency and every need, and address that. Because of that, I have, in my opinion, an overly-thorough list of what to take with you to the ride. I have a sportpak full of emergency equipment—like a Wells Fargo wagon going down the trail if you need a boot, zip tie, or BCAA—I am your overly-prepared person. Here’s what I have cooking far as mentoring. I have years of experience- some good, some bad but all invaluable. Past history and experience is great to fall back on but I prefer now to be in the moment and look forward. My focus now is safely prepping and racing the best athletes I can put my hands on to compete at their highest level. I think it’s important to reread this last sentence, most important being “to compete at their highest level” as that is all we can do. Each horse has a best case scenario performance-wise. It is our job to do every, single little thing to allow them to perform their best. It may not be in the cards of your horse, or mine to win Tevis or some such but if we prepare them to perform at their best we have done our job. If we partner up on this mentoring deal I will try to give u the tools to “git er done”! I began endurance riding in 1988 and did quite a few 25’s (LD now) before I bumped up to 50’s. My AERC record shows 2250 endurance miles and 685 LD miles and there are probably 200+ LD miles that were done in 1988 and 1989 that are not recorded by AERC as I was not a member then and I don’t believe the LD’s were even recorded by AERC in those days. In 1990, I managed my first ride—Yakima Sun Duel, held the first Saturday in June at the Nile Sawmill Site (Renegade Rendezvous ride camp). In 1992, I started managing Chinook Challenge in addition to Yakima Sun Duel. All in all, I have managed at least one ride a year since then, and many years two and three rides, some with multiple days. When I took over the Home on the Range ride, ride participation at that particular ride went to over 200 riders—so much so that Fish and Wildlife put a rider limit of 100 on our participation. 2 years later, we moved the ride to the Palouse country where we didn’t have a rider limit. Renegade Rendezvous is my favorite even though it is very challenging to manage. In good years we have a 50 mile loop and a 25 mile loop, two out checks, and lots of wonderful country to ride through. We struggle with sheep herds, fire damage, and active logging operations, along with the usual winter blow downs. If snow pack is too great to allow access to the trail at Clover Springs (6600+ feet elevation), we have an alternate trail lower down that still allows us to utilize both out vet checks. Renegade is a true endurance ride, whether you do the 25 or the 50. My husband Mike and I have a stock of ride tools (tanks, signs, ribbons, etc) that we loan out to other ride managers who need them. I also have timed for several rides and help ride managers whenever possible. I was AERC Sanctioning Director for most of my 20 years on the AERC Board, and as such was able to help ride managers schedule their rides and give new ride managers any advice they were willing to take. I will gladly help any ride manager get started, improve their existing ride, loan ride equipment or just talk logistics to help get going on paperwork. Introduced to the sport of endurance riding as a youngster, Darlene grew up riding first a Welsh pony, then Arabians and Arab crosses. In the mid 90’s, Darlene began competing as an adult, mostly riding borrowed horses. This opened the door to having some of her mentors begin asking her to ride their young stock on their first rides, or their first long distance rides of 75 or 100 miles. This went on for several years while Darlene’s daughter, Jessica competed on her horse, MC Isaac, who retired from endurance with over 4,000 miles. Darlene has started horses for people, started their horses in the sport, and she has also started people in the sport, mentoring many new people over the years. 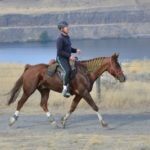 In 21 years, Darlene has amassed over 10,000 competition miles in all distances of endurance, including multi-days, LD’s, and distances 50-100 miles, on over 50 different horses with over a 90% completion rate overall. Darlene has been managing endurance rides since the late 90’s. She has managed the Mt Adams Ride for the past several years, helping it to stay the most attended ride in the NW, usually hosting over 150 riders, many of those riders traveling from out of region.